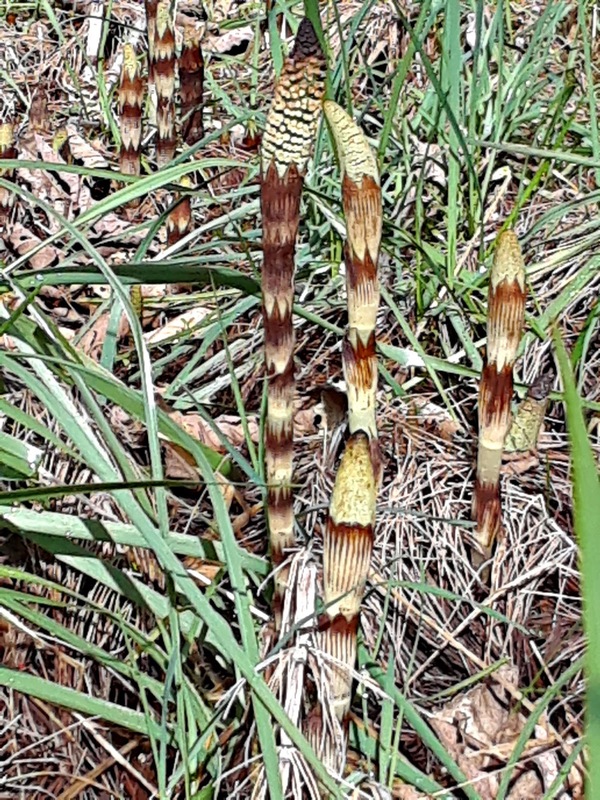 My first encounter with horsetail didn't impress me much. My mom-in-law pointed out the plant growing near a beach, explaining that native Indians used it to scrub with, much like we'd use a plastic bottlebrush today. The plant she pointed to was easy enough to recognize - a stalk with stiff "bristles" coming out on all sides. Certainly easy to recognize. 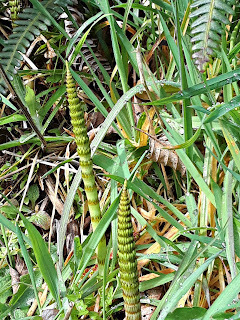 Years later, in one of my foraging books, I saw just how remarkable horsetail truly could be. First, I learned that what I'd seen growing near the beach was the non-fertile version of the plant (sometimes called "the female"). That's right, horsetail produces two distinctive-looking plants! 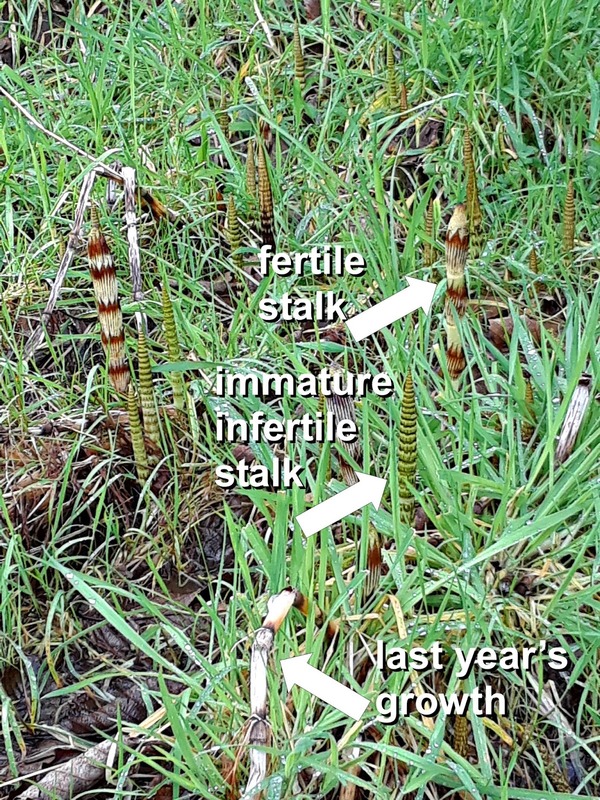 What really impressed me was the fertile versions of the plant (sometimes called "the male"). It's not only prehistoric-looking, but phallic in shape. And, lo! 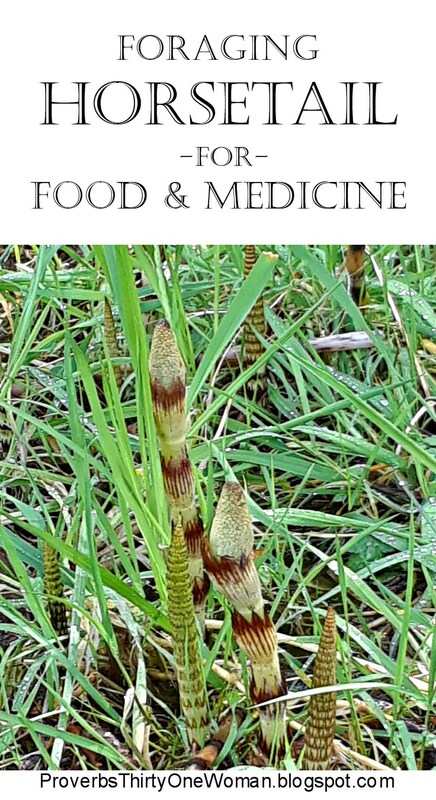 Horsetail, I learned, is both edible and medicinal! Bonus: It's packed with good minerals and nurtients. So when I found horsetail growing on our homestead last year, I was pretty excited. Because I didn't time things right, though, I didn't try eating it. This year, I made sure I was more on top of things, and last weekend, my family gave eating horsetail a try. 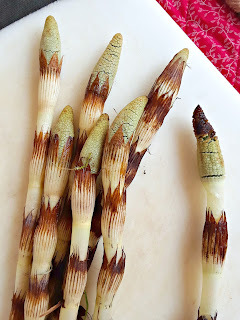 Horsetail's bulb-like rhizomes are edible. Courtesy Wikimedia Commons. 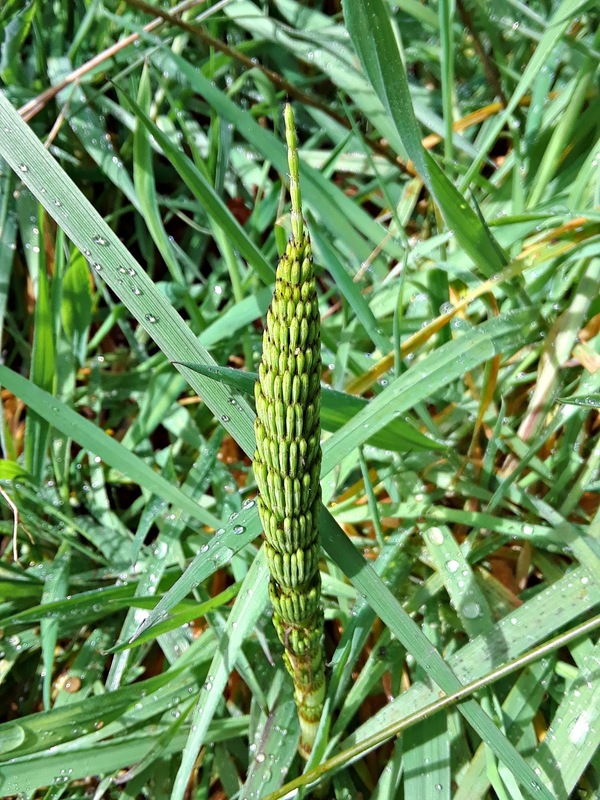 All horsetail have jointed stems that break apart easily and burst with watery liquid. The plant generally prefers damp soil; I find it in boggy areas around the homestead. The rhizomes (a type of root) are edible - though I've not tried them yet. Before you can dig them up and eat them, you need to spot a patch of horsetail in the spring, when it sends up its strange shoots. 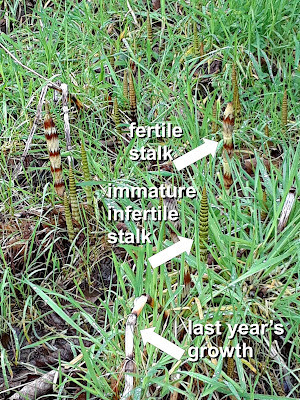 Note the location, and next year, before horsetail begins shooting up, dig around the spent shoots to find the rhizomes. Peel them and add them to the stew pot, or peel and slice and add them to salads. 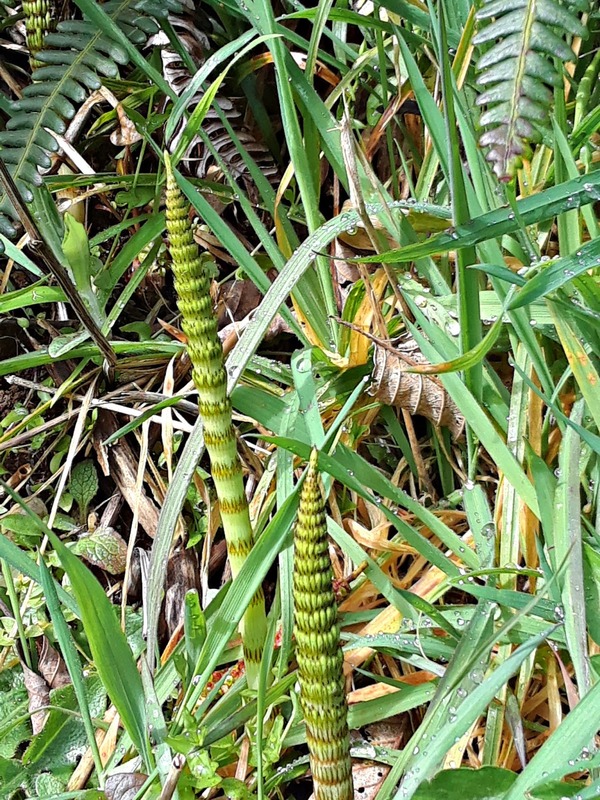 In early spring, the nutrient-rich, fertile shoots appear, resembling asparagus. Color varies; with our giant horsetail, the fertile plant comes in tones of light and dark brown. These "males" are non-photosynthesizing and have a cone-like top with rows of spore-bearing dots. They grow up to 2 feet tall (some species grow taller), and should be harvested before their cone-tops turn dark. 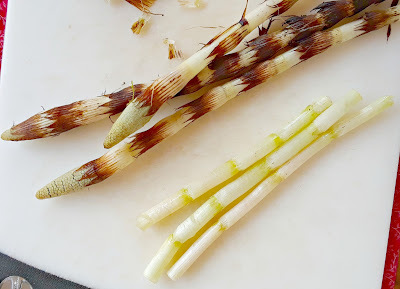 To eat these shoots, simply cut them off at ground level, then peel off the dark brown stripes found along the joints of the plant. (These stripes are packed with silica, which is bad for your teeth and could cause irritation in the body.) Cut off the cone-like tops, too. Fertile shoots that are dark on top (right) aren't very good eating. horsetail...but in order to play it extra safe, I went ahead and boiled the stalks for my family's consumption. This gave the plant a super-mild flavor (similar to cooked celery) and made it mushy, instead of crisp. You may also steam the shoots. Dark stripes should be removed before eating. After the fertile shoots pop up, the female plant (which looks like a green bottle brush) appears. At first, it's spike-like leaves are tight to the plant, but gradually they expand out, giving the plant its distinctive look. Although some foraging books say you shouldn't eat the non-fertile shoots, natives did, and so do many modern foragers, consuming them the same way they do the fertile shoots. 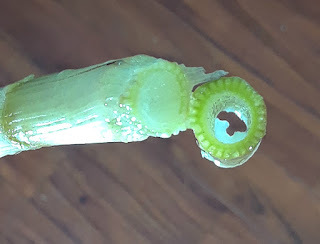 However, the non-fertile shoots are much more work because you must peel them completely before consumption. (the outer layer is too full of silica to be safe to eat.) In addition, some sources claim non-fertile shoots must be "thoroughly boiled" before eating. Douglas Deur, in his book Pacific Northwest Foraging, notes that boiling with repeated changes to the water reduces any toxicity that might be found in the plant, due to chemicals in the soil. 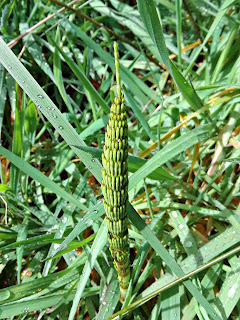 Another way horsetail is unique is that it's one of the few plants with bio-available silica. Therefore, drinking horsetail tea can help repair damaged bones and connective tissue, while also encouraging strong hair and nails. The tea is also traditionally used to support the kidney, bladder, and prostate. In addition, horsetail is diuretic, and herbalists sometimes use it to treat urinary tract infections, or to dissolve urinary stones. It's also said horsetail can curb excessive menstrual flow and internal bleeding and treat bronchitis, tuberculosis, and asthma. In addition to its high silica content, horsetail is full of calcium, sulfur, manganese, potassium, silicic acid, flavonoids, saponins, sterols, aluminum salts, and tannins. There is a big HOWEVER when using horsetail as medicine. This plant should never be consumed regularly or for a long period of time because it can lead to thiamine deficiency. 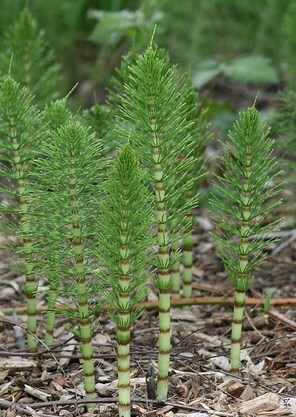 When making horsetail medicine, always harvest non-fertile shoots before their leaves begin to droop. This helps prevent digestive upset. To dry the plant, hang whole stalks in a cool, dark location. It's important to avoid breathing in silica crystals that may appear as dust once the plant is dried; it is very irritating to the respiratory tract. To be extra cautious, wear a mask when placing dried horsetail in jars or creating herbal powders from the dried plant material. Pour boiling water over about 2 or 3 grams of chopped non-fertile horsetail stalk. Cover with a saucer and allow the tea to steep for 10 or 15 minutes. Remove the saucer and strain the tea through two layers of cheesecloth. Drink 4 oz. three times daily between meals. More experience herbalists can turn fresh horsetail into a tincture (1:5). Consume 1 - 4 ml. three times daily. 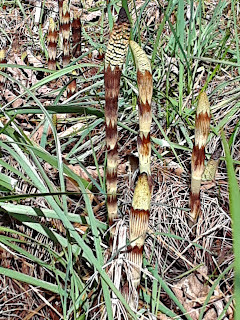 Horsetail is made of segments, each containing mineral water. Just as all prescription medicines have warnings, so do natural medicines. For some people, eating quantities of horsetail raw "may be mildly toxic" (Deur). Horsetail is toxic to livestock and perhaps to pets. When handling dried horsetail, it's wise to wear a mask to avoid the irritating dust it might produce. As with all wild edibles, pay attention to where you harvest. Horsetail is especially good at absorbing heavy metals and chemicals in the soil. Also, it's possible to be allergic to any plant. Show wisdom by eating a small quantity to see if your body reacts negatively. If horsetail is used with Benzodiazepines, Disulfiram, or Metronidazole, it may cause "a disulfiram-like reaction." (Source.) Taking horsetail along with medicines that deplete the body of potassium (like corticosteroids, diuretics, and laxative stimulants) increases the risk of developing dangerously low potassium. Do not use horsetail with licorice, since it may lead to low levels of potassium. Do not take horsetail medicinally if you are pregnant or nursing, have heart problems, drink too much alcohol, or are prone to thiamine deficiencies. Large quantities of the horsetail can be toxic because it contains thiaminase, which has the potential to deplete the body of B vitamins. In small quantities, this is not an issue. Cooking horsetail also eliminates this problem. Disclaimer: I am not a doctor, nor should anything on this website (www.ProverbsThirtyOneWoman.blogspot.com) be considered medical advice. The FDA requires me to say that products mentioned, linked to, or displayed on this website are not intended to diagnose, treat, cure, or prevent any disease. The information on this web site is designed for general informational purposes only. It is not intended to be a substitute for qualified medical advice or care. There are no assurances of the information being fit or suited to your medical needs, and to the maximum extent allowed by law disclaim any and all warranties and liabilities related to your use of any of the information obtained from the website. Your use of this website does not constitute a doctor-patient relationship. No information on this website should be considered complete, nor should it be used as a substitute for a visit to, consultation with, or the advice of a physician or other qualified health care provider.